I didn’t start using coupons regularly until August 2014. I started reading everything I could find to learn more about it and put into practice. I’m not an extreme couponer, but I will use a coupon if it’s for something I need. My favourite is when I can find something on sale that I need to buy AND I have a coupon. It’s a double whammy! 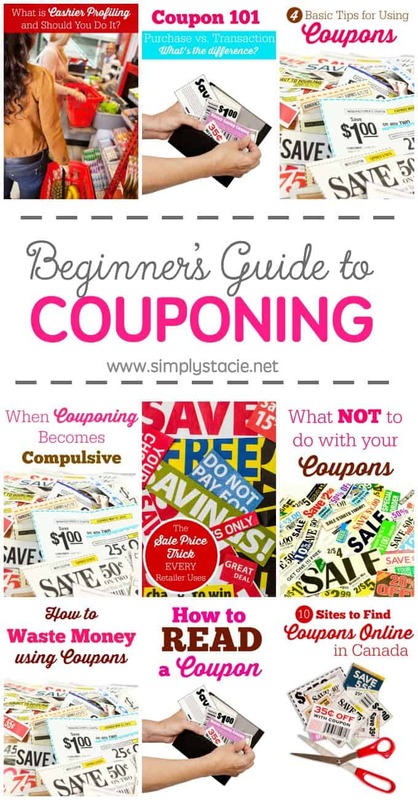 I’ve written quite a few posts on the subject over the last year and I’m sharing them all here in this resource, a Beginner’s Guide to Couponing, in case you missed them. I’ve also included a few other posts that I thought would be worth checking out too. What is cashier profiling and should you do it? This is a great guide to coupons. I WANT to be a couponer, but it is so intimidating when I sit down to plan it all out. Definitely some great information for those who are just beginning! A great bit of information for me as food stuffs are much more expensive because of our low dollar I will begin to use much more. I’ve moved away from the traditional coupon and moved more to the apps that give cash back like checkout51 and zweet etc…. I could never remember what coupons I had, it there was a sale for the, if they were expired etc. I also like coupgon as those are coupons on the phone for certain stores. This is something I’m extremely interested in with the raising grocery prices. These are some great tips, and will be very helpful especially with the cost of food going up so much lately! Brilliant! I used to coupon and need to get back into it.